Prophets of Science Fiction Review. If you're a fan of science fiction movies, than Prophets of Science is an interesting insight into the merging of two worlds. 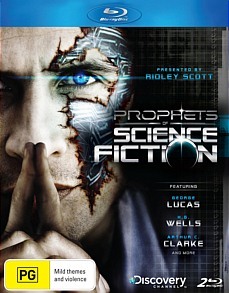 Presented by Ridley Scott (Prometheus), this two-part documentary collects the excellent SBS TV series PROPHETS OF SCIENCE FICTION and focuses on how "science fiction" has become science in the modern world. By linking science with some of the great science fiction writers of our time and before such as Mary Shelley, Arthur C. Clarke and George Lucas, each episode goes into some detail about how their ideas have become a reality. With Prometheus just being released (07/06/2012), this collection will be available on the 27th of June on both Blu-ray and DVD for a recommended retail price of $34.95AUD which is perfect timing for sci-fi buffs. Given the controversial story of Prometheus regarding artificial life and the origin of mankind, Scott proves to be the perfect catalyst on how ideas have become real-world inventions. The series interviews a wide range of people from directors such as George Lucas to scientists such as theoretical physicist Michio Kaku to give their knowledge on a particular area. Add in film clips from various science fiction films and re-enactments and Prophets of Science Fiction comes together quite well. The only drawback to the series is that not all the episodes are totally interesting but of course, this is probably due to personal taste. Nonetheless, it's also a great cinema lesson such as the first episode that deals with Mary Shelley and her creation of Frankenstein that spawned a series of Hollywood films and how medical science has mirrored some of her ideas. It even focuses on artificial intelligence with some great references to Robocop.. In the end, Prophets of Science is a collection of amazing visionaries and links science fiction with science and how their ideas have led to some amazing advances in both medical and technological advances. If you're a fan of science fiction movies, than Prophets of Science is an interesting insight into the merging of two worlds.